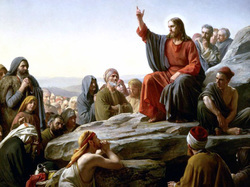 Jesus taught many things in the Sermon on the Mount and other occasions. Whether surrounded by a multitude of strangers or a handful of friends, Jesus spent much of his ministry teaching. Some these lessons were on the subject of prayer. Jesus's disciples asked him to teach them how to prayer. What he taught was a pattern we often repeat as the Lord's Prayer. More on that topic at this prayer page - The Lord's Prayer. For more of Jesus teachings follow these links to biblegateway.com and read the passages in as many different translations as you like. Matthew 5:44 - Jesus said to pray for our enemies. Matthew 6:5-8 - Prayer isn't for showing off, be yourself.